All species of cichlid fish are extremely dedicated to the growth and development of their offspring into sexually mature adults (Keenleyside, 1991). From fertilization through offspring independence, parental care can last up to 9 weeks and requires a tremendous investment of time and energy funneled into egg and school maintenance and protection (Alemadi & Wisenden, 2002; Barlow, 2000; Gunther, 1972). 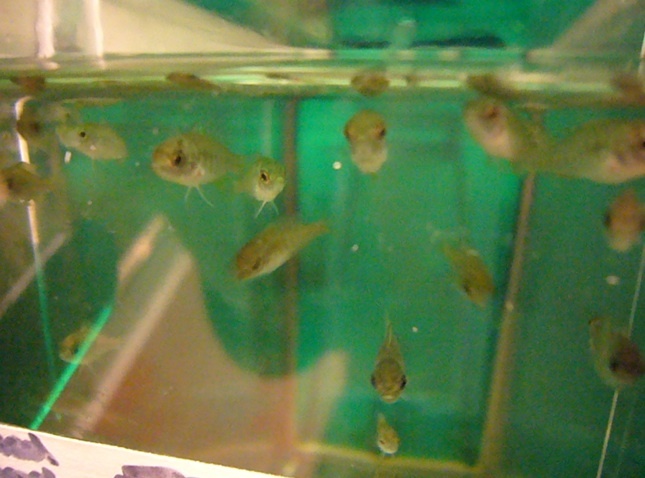 Since such detailed care and high expenditures of energy are required to raise the young to maturity, evolutionary theory stipulates that in the case of the cichlid, in order to maximize efficiency in benefiting it’s own reproductive success, it would be important for it to expend the least amount of energy in deriving the greatest benefit in caring for its biological offspring (Hamilton, 1964). This raises the question of if and how cichlids may identify their family members from the family members of others in order to appropriately direct nepotistic preference. Young fry possess the ability to respond to chemosensory and visual cues related to their species (Alemadi & Wisenden, 2002; Nobel, 1939) and mothers have been shown to discriminate between their young and the young of other species (Barlow, 2000). 3) to identify the presence or absence of a chemosensory cue in kin-recognition. The results show that there is a preference for mothers to accept their young into their buccal cavities in times of distress. In addition the data suggests that fry play a role in the congregation process and are not passive recipients of parental care. The two brooding wild caught females that had spawned and released their brood within one to four days of one another were separated from their broods and placed into mother’s-zone isolation at either end of the observation tank. Fry from one of the two mothers, were placed gently into a "fry-zone" in between the females. The "preference score" was calculated as" +1 point was to either female if a fry crossed the dividing line towards it; +2 wo points to either female if the fry came within two of its own body lengths; +3 points if the fry entered the mouth of the female; -1 point if the fry returned to central partition. After the 30-minute observation period had passed, scores were summed to a preference score. Analysis of the preference score’s significance was obtained through a paired t.test. The obtained p-value of 0.096 failed to allow rejection of the null hypothesis. The proximity of the obtaiend p-value to thedesiured significance threshold of 0.05, and a mean difference of 20 between the preference scores suggests that with a larger sample size, the results of the experiment would likely support the hypothesis that there is a preference among fry to congreataet with their biological mother. The data in experiment two exhibits a strong trend that suggests a preference on the part of the fry to seek out their mother in distressing situations. This is interesting because it shows that the fry are involved in the retrieval process, thus reorganizing how we may understand retrieval. 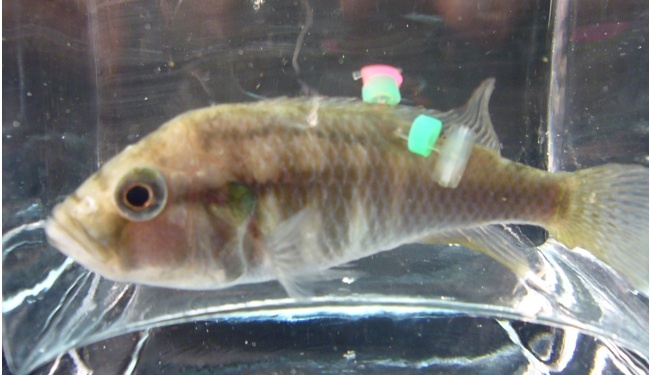 The results suggest that the process of retrieval is not purely a mother-lead repossession of her fry, but instead is initiated on a call and response system where either the mother or the fry or both sends and recognizes cues regarding its distress. Qualitative data recorded during the observation periods attached to both experiments one and two show that fry became most interested in their mothers— interest defined as facing and approaching the mother— when the females nose was pointed towards the bottom of the tank. Upon the mother’s expression of this behavior, fry would approach her, individually or as a school, and tilt their nose towards the bottom of the tank repeatedly until disturbed by either the swimming away of, or retrieval by their mothers. This notable occurrence flags an area of potential study in fry-mother cues.